The afternoon was spend trying to figure out what I should do, both in the immediate sense of what could be done that afternoon and also looking to the future, which at the moment seems considerably hazy, more so even than before. Might be a good thing I suppose. Life is an uncertain journey, with never an indication of which direction it will take you, or the twists and turns along the way. Luckily my wandering thoughts were interrupted by a message reminding me that some friends were going to meet up for dinner and a movie that night. 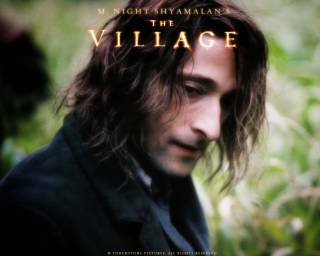 We were going to see The Village based on the book by M. Night Shyamalan. A few people didn't want to see it because after watching the trailer, they thought it would be too scary. It wasn't scary at all, in fact people going to see it who are expecting a good fright will sadly be disappointed; it's more of a love story than horror. I could hear the cries of "come on..." during the drawn out dialogue, from a few teenage boys sitting behind us and "finally!" when some of the few bits of action burst on to screen. I haven't yet read the book, but I'm sure it must be better than this poor excuse for a film. I find that I tend to dislike movies that use steadicam shooting to begin with, but this movie almost reminded me of some of the student films from my days doing media production at university. It was also very plot driven, with none of the characters showing any real change throughout the story and the small twists and changes to the plot could easily be guessed. Some obviously liked it though as you can see from the many quotes proudly displayed on the movie's website, that is of course if those glowing reviews weren't purchased. After the movie, in an attempt to save us from sitting around for ages doing nothing, we decided to visit The Brook Hotel. We sat around there for a while... doing nothing. I got one drink, but no one else it seemed was very thirsty. We soon left.